Our present and our past are manifestly intertwined. Memories are not identical simulations of the past, but are stories shaped by our current perspectives of others, the world, and ourselves. As a result, the gathering of early recollections can be used as a projective technique that indicates our strengths, goals, lines of movement, fears, and a host of other relevant psychological data. Early Recollections are a quick, accurate, and cost-effective personality assessment demonstrated to have similar reliability and validity to other personality measures. 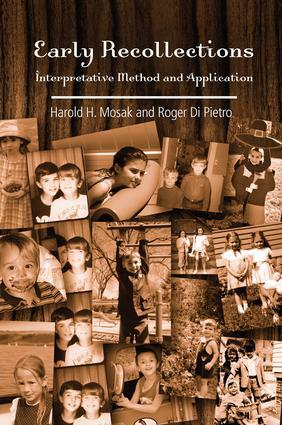 Both a comprehensive and accessible text, Early Recollections: Interpretative Method and Application presents a constructivist approach and systematic development of early recollection theory. Mosak and Di Pietro invite students to think and actively engage in problem solving rather than merely read for content. Supported by step-by-step examples, this book also offers a perspective suitable for application by Adlerian practitioners, non-Adlerian clinicians, and all other mental health professionals and students seeking a new framework for evaluating personality. What Are Early Recollections and What Can We Learn From Them?